Engineers specializing in cross-laminated timber (CLT) see its future less in boutique prototype towers, requiring case-by-case demonstrations for approval, than in a meat-and-potatoes mid-rise market. 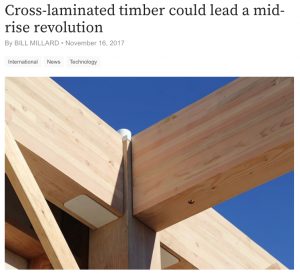 While, according to Colorado State University’s John van de Lindt, “some of those pioneering early CLT buildings are really almost like a partial R&D project in disguise,” he and colleagues predict that the field’s maturation depends on the incorporation of research-driven CLT standards into building codes. Pei cites the 2011 CLT Handbook by Canadian nonprofit FPInnovations as a pivotal document, republished in a 2013 U.S. edition with input from the American Wood Council (AWC), Forest Products Laboratory, WoodWorks, and APA: The Engineered Wood Association (formerly the American Plywood Association). In 2011, APA and the American National Standards Institute developed a performance-based standard, PRG 320, updating it in 2012 and 2017; it offers detailed specifications on CLT products’ composition, dimensions, shear strength, stiffness, and other properties. The AWC’s National Design Specifications for Wood Construction and the IBC include basic CLT sections in their 2015 editions.